I have a PC8801MK2SR and I would like to connect a "3.5 floppy. Is it possible to connect a "3.5 by replacing one of the "5 inch floppy drives? And if possible, how can I do this? Is it possible to take a PC98 "3.5 floppy and put it into the PC88 computer, or is it not compatible? The question is because although I eventually want to use a HxC floppy drive emulator, I first want to try this solution since I have a big bunch of "3.5 floppies in my house that would be useful. Anyone with experience of this? Is the procedure the same as with connecting the HxC floppy emulator? Could I just take/make a cable intended for the HxC and then just put a "3.5 floppy drive there instead of the HxC? Sorry for the noob questions. Thanks in advance. Hi there. I have a non-SR PC8801mkII and have been looking into it myself. The gentleman in the link made a handmade adapter, but I'm not sure if I will do the same thing or just cut up a ribbon cable. I do not know enough about floppy drive connectors yet to tell if there is an easier way - perhaps something off the shelf. I am not sure if this is the same cable as the one you would use with an HxC/Gotek but I assume so. Good luck! Please let me know if you are successful, or even if you want to discuss general PC-88 topics/repairs. It's hard to find English-language material on these computers. I ended up building an adapter board, though the first run has a lot of mistakes that I would like to fix before I give out the kicad files and BOM. Unfortunately I am quite new to electronics. I used the HxC firmware on a Gotek. Great stuff! I can confirm that Nishida-san's adapter schematic above works. This adapter is totally useless for the SD HxC & HxC Gotek : You don't need to make such adapter since you can change the interface mode to emulate the shugart floppy bus. In that case the adapter board I built only really provides an edge connector -> 34 pin IDC adapter, which you should just be able to crimp onto the ribbon cable directly, since the Gotek/HxC can be convinced to use Shugart mode instead. You should only need that adapter wiring for an IBM PC 3.5" floppy drive, from the sound of it. I haven't tested my board with one yet, only the Gotek. Update: this adapter had some problems when I was trying to use two drives at once. I made a new version that was just a Shugart straight-through (e.g. 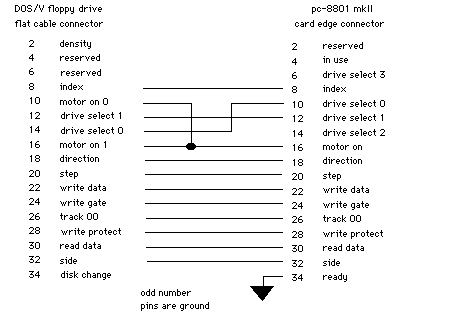 pin 2 to pin 2, 34 to 34, etc) that adapted the edge-connector to a 34-pin female IDC floppy connector. Now it works great with two Goteks. Thanks for the firmware and the hint, Jeff!